Mitochondrial DNA (mtDNA) haplogroup data provide valuable information for inferring patterns of variation and population structure of maternal lineages. 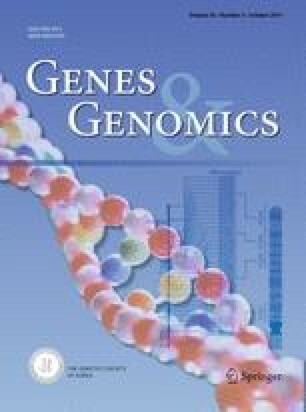 In this study, we analyzed the distribution of mtDNA haplogroup variation using a 20-plex SNaPshot assay for determination of the major East Asian haplogroups to evaluate the possible genetic structure and differentiation from 708 unrelated individuals residing in six major provinces in Korea. The most common mtDNA haplogroups were found to be D4 and B4, followed by A, D4a, and M7, which are prevalent in East Asian populations. All provinces exhibited high haplogroup diversities, ranging from 0.8957 in Jeju Island to 0.9284 in Gyeongsang. Pair-wise F ST distances and AMOVA of the studied Korean provinces reflected no maternal subpopulation heterogeneity present within the population group, except for Jeju Island, showing small, but statistically significant differences between the populations (p < 0.01). This result indicates that the Jeju Island may point to the need for creating a local mtDNA database, to avoid bias in forensic parameters estimates caused by genetic heterogeneity of the population. However, since there is no geographic pattern to suggest this result represents any population heterogeneity on a peninsular level in Korea, the present data could be useful in serving as a basis for comprehensive Korean population and forensic mtDNA database. The online version of this article (doi: 10.1007/s13258-014-0194-9) contains supplementary material, which is available to authorized users. The authors would like to thank all the volunteers for providing DNA samples. They also thank S.S. Hong and S.G. Lee for technical assistance to this survey. The present research was supported by the research fund of Dankook University in 2012.